Located in central Arizona, the Appaloosas here are some of the finest breeding and quality to be found. Conformation, disposition and style are a must, with color a plus. 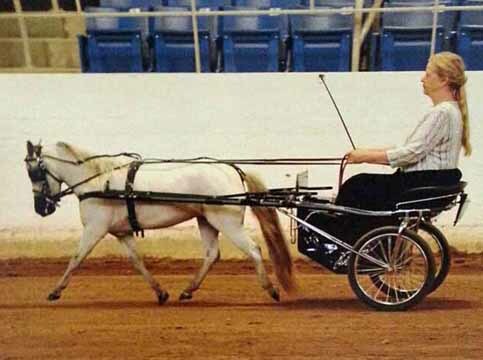 Emphasis is put on ending up with a well balanced driving or all around performance horse. All horses at Heather Glen Farm are double registered AMHA and AMHR. Please see bottom of page for sales conditions. I have truly struggled over this decision, but am offering Karma for sale. I have a small herd and they are becoming too related- I own her sire and keeping her brother for a future stallion prospect, so am regretfully offering her. Her sire, CR Lakota Renegade, is a National, Regional and World Top Ten. He has done very well in the show ring.. (See stallion page) He has a pedigree full of top Appaloosas with the first 3 generations being all Appaloosa and he was sired by Carousel Designer Legacy- who also had top awards in Halter, Color & Driving. Karma's dam is a very loud colored near leopard mare whose pedigree goes back to Toyland Little Sombrero and Toyland Zodiac. Karma was with Bryce Baker for driving training for a year, and her second show was AMHA Regionals where she earned a Top Ten in Classic Gentlemans Driving and also Mares Driving. With a brief tune up, this mare could go back in the show ring. Karma is a bay fewspot Appaloosa, and she produced a loud leopard filly for me, however is open now as I have no stallion unrelated to breed her to. 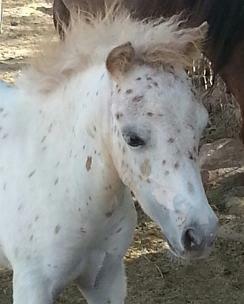 Dencey's Appaloosa dam is a daughter of Yellow Diamond Little Feather. Dencey is refined with a long neck and legs, nice topline and could be suitable for driving. She has a very kind disposition and produced a beautiful leopard colt when bred. She is currently open by choice. Junior is sired by the great Brewers Classic Supreme, who was World Champion in Halter in 1991 and 1993 and 3rd in the World in 1992. Not a surprise since he was sired by Brewers Orion Classic, who was World Grand Champion Jr Stallion, World Champion Yearling Stallion and sired by Orion Light Vant Huttenest. Junior's dam Bar B Littlebits Touch Of Class, earned World Champion Two Year Old Mare and World Reserve Grand Champion Jr Mare. 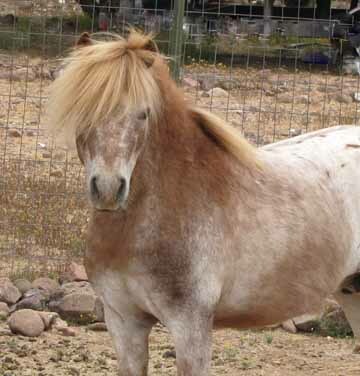 She was sired by Goforths Little Bit who won numerous National Grand Champion titles under the International Miniature Horse Association. 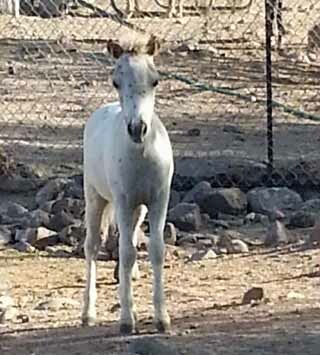 Junior is consistent in siring foals with nice overall balance and pretty heads. Joker has personality plus. At just a few days old, will come running to demand attention from anyone he can. Leggy and correct, this colt was born on April 13. Sired by a son of multi World Champions Brewers Classic Supreme and Bar B Littlebits Touch of Class. Joker's dam is a fewspot daughter of CR Lakota Renegade, National and Regional Top Ten leopard stallion and son of Carousel Designer Legacy. Her dam is a daughter of Yellow Diamond Little Feather. Does not sell with a height guarantee. Nice refined leggy colt that should make a driving horse! All buyers are welcome to a vet check of any horse at their own expense. 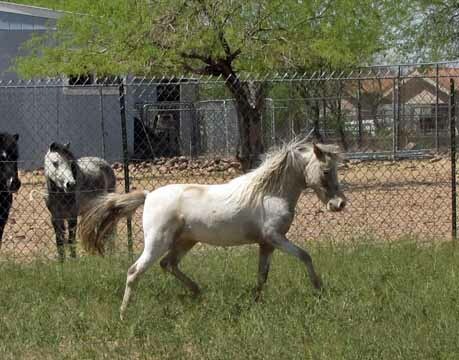 Unless already permanent registered at mature height, horses do not come with a height guarantee as mature height of a foal can only be estimated. Short term payment arrangements accepted but all horses require a non refundable deposit of half down. Buyer is responsible for any shipping arrangements and fees. Free board up to 30 days from when said horse is ready to leave the farm, board fees apply after 30 days. Any balances due (for any reason) must be paid in full and cleared before the horse leaves the farm.